Expert venetian plaster, Italian Marmorino plasters, glazing and marble polished surfaces. Italian Venetian Plasters, Marmorino Plaster, Plastering Repairs, Metallic, Fine Venetian Plasters in Miami South Florida by TLC. Plastering services in Miami, venetian plasters in Miami Beach, Sunny Isles, the Florida Keys, Boca Raton. Fort Lauderdale venetian plaster masters using marmorino, authentic classic Italian plasters with marble and lime, professional top quality and repairs. Their stunning faux painting and venetian plaster finishes are in custom high end homes, resorts, luxury south Florida properties and featured in magazines. Complete designs, plastering, repairs, decorative painting and custom faux finishes are some of the TLC fortes. South Florida Miami venetian plaster company TLC creates beautiful custom plaster marble wall finishes! Polished and buffed, gorgeous finished walls with classic venetian plasters in Miami Florida by TLC painting company. Miami painting contractors TLC are Italian stucco masters using real Italian plasters, Marmarino and Firenze plaster. This plaster finish by TLC painters is in the penthouse suite of Ocean One in Aventura, right on the Miami Beach coastline. The walls, ceilings and columns were all finished with this beautiful low VOC, natural stone product, and TLC does immaculate, precision, high end work every time. TLC Interiors and Exteriors Inc are licensed south Florida painting contractors who specialize in exquisite Italian venetian plastering in Miami, Fort Lauderdale, Boca Raton and the Florida Keys. Classic venetian plaster finishes, aka Spatula Stuhhi Classico are non toxic, fade resistant and non flammable. TLC uses imported plasters from Italy, Firenzecolor and Triarch metallic, enhanced plasters for stucco and exteriors. A beautiful result on the ceiling of this residence in Sunny Isles. Miami venetian plaster finishes by TLC are stunning! Venetian Plaster walls for Florida Keys interior Design in Key Largo FL, by ﻿Florida Keys Painting Contractors﻿﻿﻿ TLC Interiors and Exteriors. In the Florida Keys, Islamorada, Big Pine, Key West to Key Largo, expert venetian plastering in south Florida by artist Eric Hall of TLC. Here a designer's studio in Marathon venetian plaster with marble. Quality painting for high end luxury homes and resorts throughout south Florida and the Florida Keys Islands. This high speed buffed polished venetian plaster with silver wax and marble on the two pictures on the right, is a stunning wall finish for this home in Key Largo! Venetian plaster with a bit of texture on the other two pics. Renovations, repairs, refinishing and painting for businesses and homes in south Florida and the Florida Keys. Beautiful custom wall finishes installed and designed by Jeanne Hall and Eric Hall of TLC Design Studio. A polished marble look with Italian plasters, glazes and marble with lime, using Miami Firenzecolor plasters, a luxurious finish. 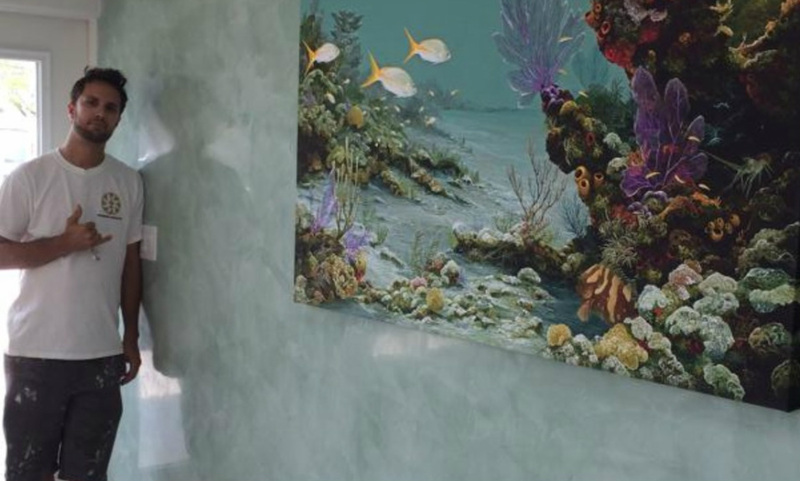 TLC has done many custom plastering and painting installations in Key Largo at Ocean Reef Club. TLC Contract Painters utilize cutting edge techniques for wall textures and fine finishes for homes and businesses throughout the Florida Keys and south Florida areas. Experts in faux, goldleafing, interior and exterior painting and various surface technologies, TLC Interiors & Exteriors Inc is a south Florida painting company that restores and paints houses in the Florida Keys and throughout south Florida counties, Monroe, Miami - Dade, and Broward County and serves commercial business's as well. There are many color choices available with venetian plasters and when polished like these walls, it reflects light very beautifully. Here the owners chose to accentuate the outdoor colors for the venetian plaster finish by TLC for a mountain cabin in North Carolina.